I am going to share an oldie but a goodie! 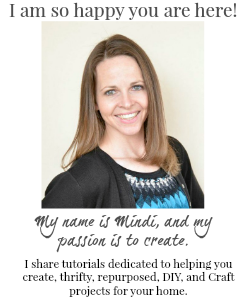 A couple of years back I shared this on My Repurposed Life, and then I gave a teaser on my blog here. I am exited to share the full tutorial with you today. 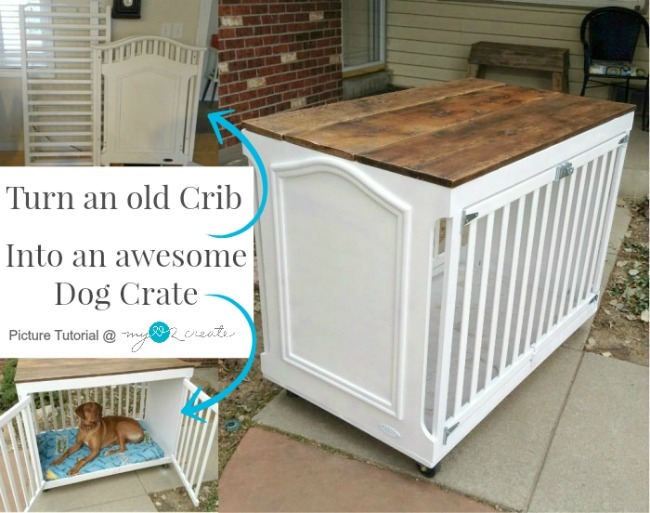 This has been one of my most popular projects, how to Turn an old Crib into an awesome Dog Crate! I was looking for an old baby crib, not a dog crate! I see them all the time on the Craig's list free section, and sure enough after looking for about a week I found this one. 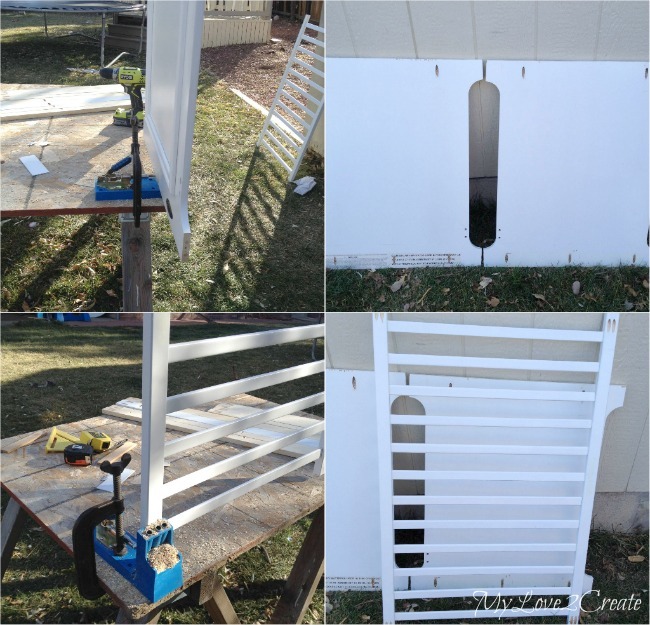 I knew I could use it to build a dog crate, it was perfect, solid wood and free! I started by deciding how large to make my crate. I looked online for XL dog crates and used the measurements to help me pick a size for Sunny's crate. I made sure it was big enough to fit her when she would be full grown, and small enough to fit through my doorways in my home. It ended up being 27 inches wide 46 1/2 inches long. 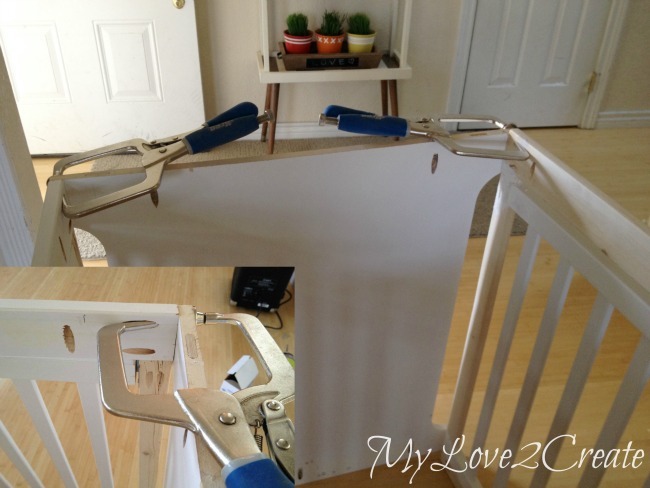 In the photo above I am cutting the crib ends to 27 inches wide. First I cut one crib top off (top left), then used it to measure where to cut the second (top right). 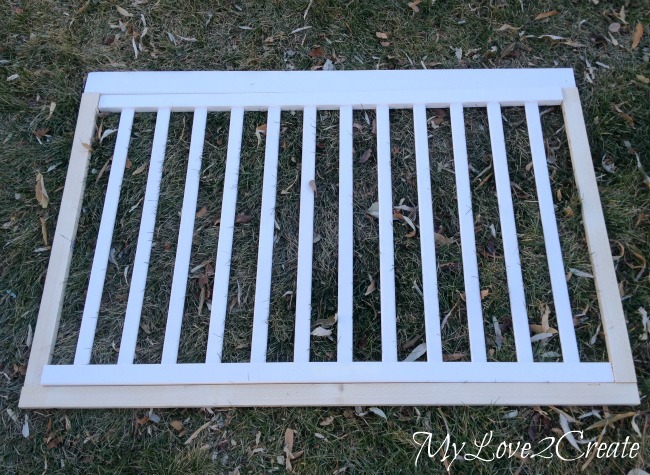 Using the end pieces as a guide for how to make the sides, I placed a crib rail over the end piece and added boards until I had what I wanted. 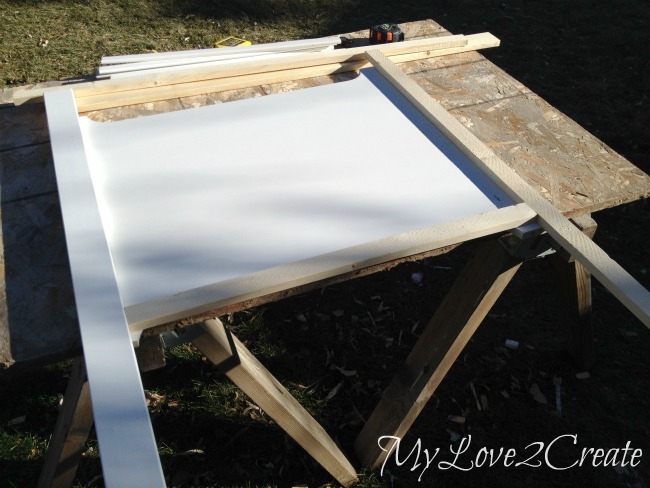 I was able to use a 1x3 board from the crib, top white board, and then I used 1x2's for the side and bottom, which I got from my scrap wood pile. Dang! Can you see what I did wrong? I didn't use my crib end as a guide and I cut my side 1x2's too short! See the gap where the arrow is pointing? Lesson learned, check and double check when you are winging it! Luckily I had a few more 1x2's in my stash to re-cut without having to go to the store. Phew! Here is a shot of what I was supposed to do the first time around. I used the crib end to make sure my cuts were the right height, or you could measure...I am very visual so using the actual item makes it quick and easy. When I REMEMBER to use it of course! Now that is what I like to see! Mmmmkay movin' on. 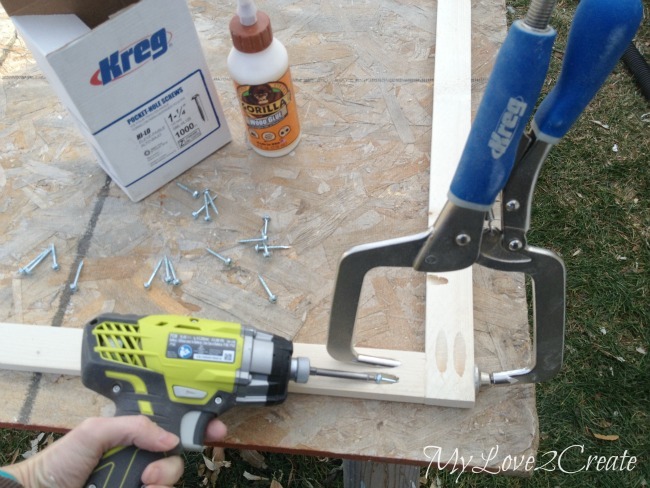 In order to attach all my frame pieces together I used my Kreg Jig K4 Pocket Hole System to drill pocket holes. 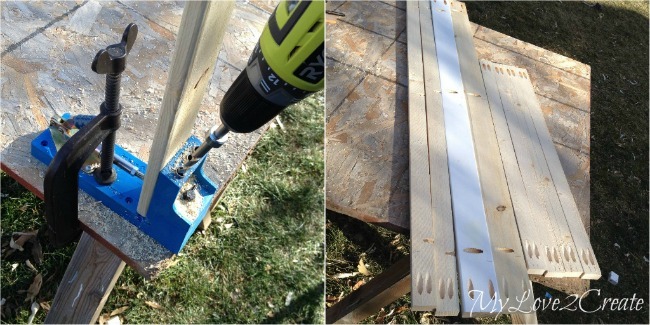 I love this tool for attaching wood together, If you look closely you can see I also drilled pocket holes into my long top and bottom boards. They will be for attaching the top and bottom of the crate later on. 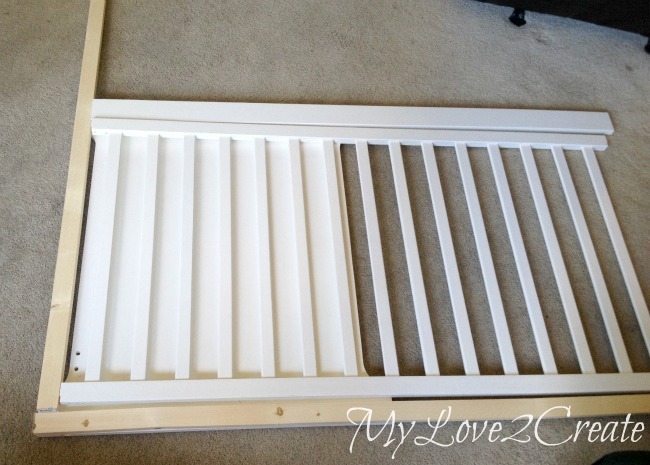 I also drilled pocket holes in the crib ends and the crib rails. 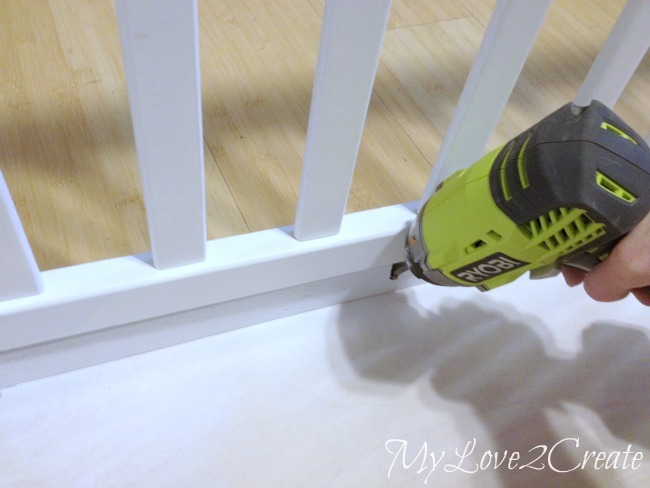 Since the front crib rail will be the "gate" and will be on hinges I didn't drill pocket hole into it. Instead I marked the top and and bottom and cut it in half on my miter saw. For an extra set of hands and to keep my boards together as I drill, I used my Kreg KHC-RAC Right Angle Clamp to hold the boards together as I attached the boards with my 1 1/4'' pocket hole screws. Oh yeah, and don't forget the wood glue! 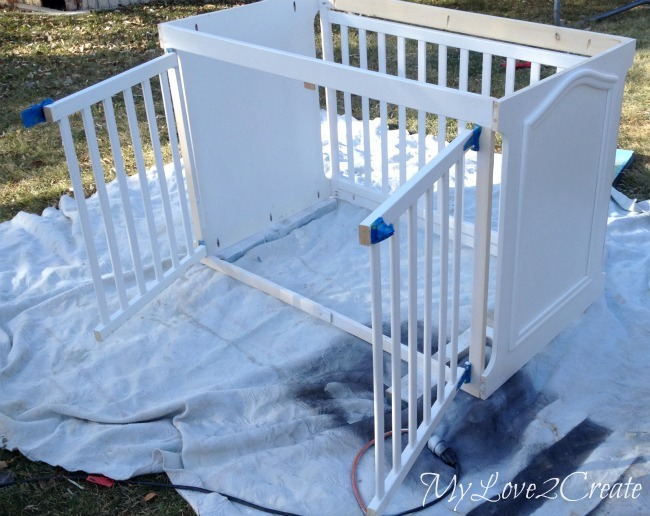 With the outer frame built, next up was adding the crib rails. 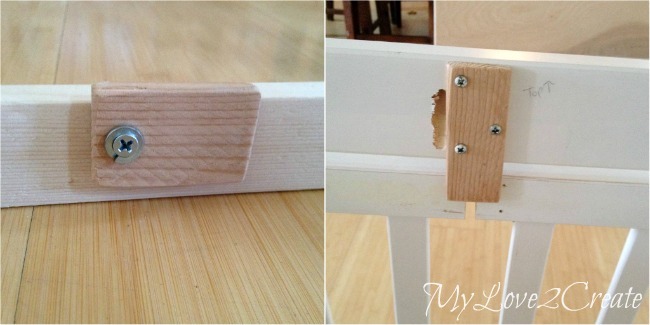 On the left I have attached the back piece with pocket hole screws and wood glue to the frame. 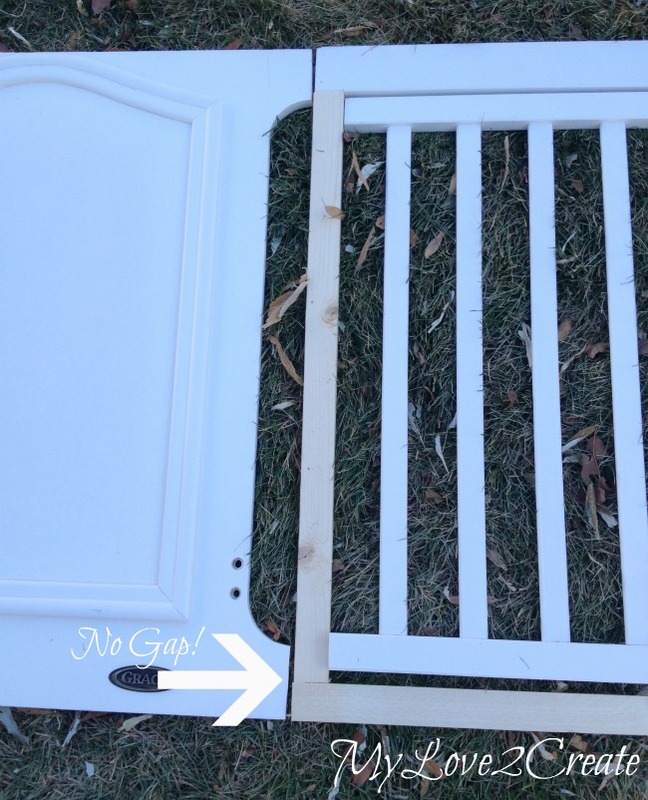 In the photo on the right, I added hinges on all four ends so the doors open. I used painter's tape to hold them in place while I attached the hinges. Again with the huge help of my awesome Kreg KHC-RAC Right Angle Clamp I attached the sides to the ends, can you tell I love these things!! Seriously I don't know how I used to build without them! I used some scrap plywood my Father-in-law got from his neighbor, and traced my crate onto it. Then I simply cut on the lines. I ended up using some 70 year old barn wood for the top, since I had no plywood left that would fit the size I needed. I used two boards and then cut the third in half so they would all fit. I used my circular saw to do the job (middle photo). I love this wood, and have used it in several projects, like my Cubby Shelf Revamp, my Cabinet Doors into Children's Desk, the Rustic Industrial Chairs, and my Rustic Ironman Medal Display. I ended up using 5 gallon paint sticks as stoppers. I made one for the top inside so the doors would not swing into the crate (top right). Then one that can be turned on the bottom front to help the doors stay closed. I originally used this screw and washer on the bottom, but eventually drilled a bigger hole and added a bolt with a washer and nut on the inside. I did this because the screw would need tightening every so often and that got old. I have not had a problem since I added the bolt. Next up was a quick coat of white paint! As I waited for the paint to dry I did a little doctor work on my old barn wood for the top. Some of the boards were cracked, so I added wood glue and clamped them up. 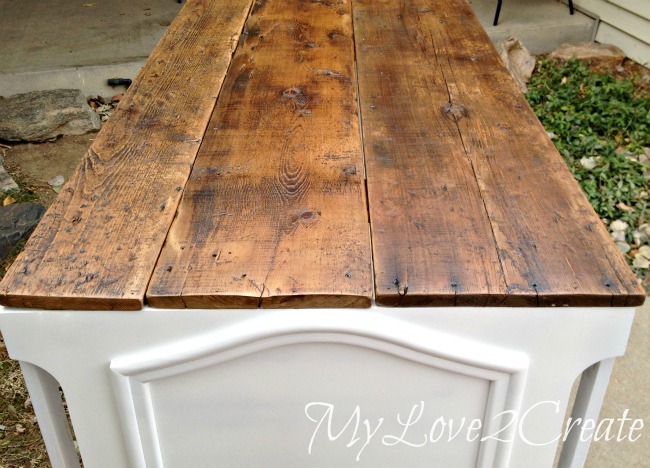 Working with reclaimed wood is worth the extra effort, it is soooo pretty! I attached the crate to the bottom piece with the pocket holes I had previously drilled. As a suggestion from a friend, I added peel and stick vinyl to the plywood bottom of the crate. This is great for accidents, witch rarely happen in crates, but better safe than sorry! They were only 99 cents each at Home Depot, so it was $9 total. Plus they were easy to install! 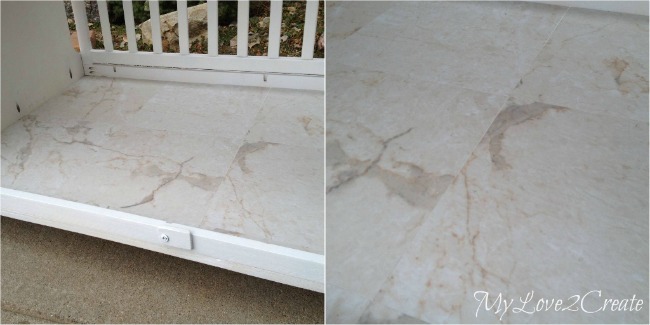 I decided last minute to add casters for easy moving and used these ones that I had gotten free off the side of the road at our city's spring clean up. They needed a little scrubbing, but work great. Well, great enough for me to move the crate around if I need too! Don't worry they don't roll when Sunny is in the crate, it is on carpet. 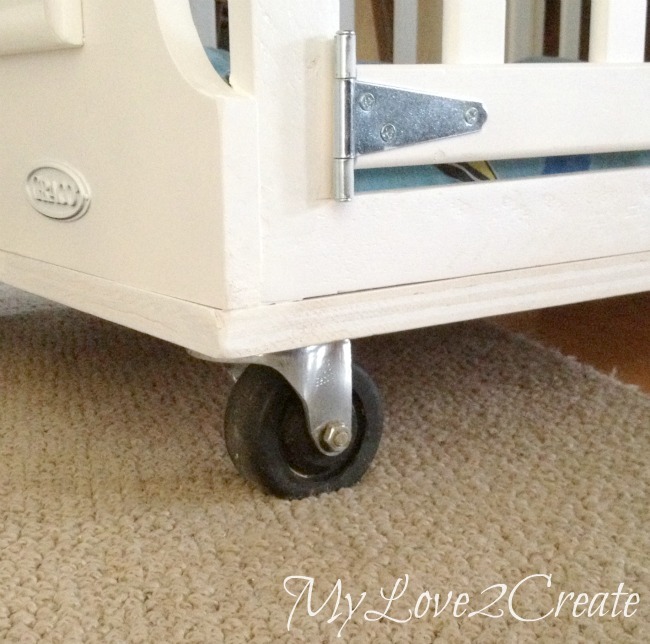 If you had your crate on a hard wood floor and wanted casters I suggest having locking ones. I actually love the way it looks with casters and it is super easy to move around, this thing is huge and I really couldn't manage it without them! For the top I decided to just nail it on, but first I added support boards underneath like I did to the wood in this project here. And now you can see why I love this wood so much...It is so beautiful!! I did seal it with three coats of poly sanding with 400 grit in between coats 1 and 2. 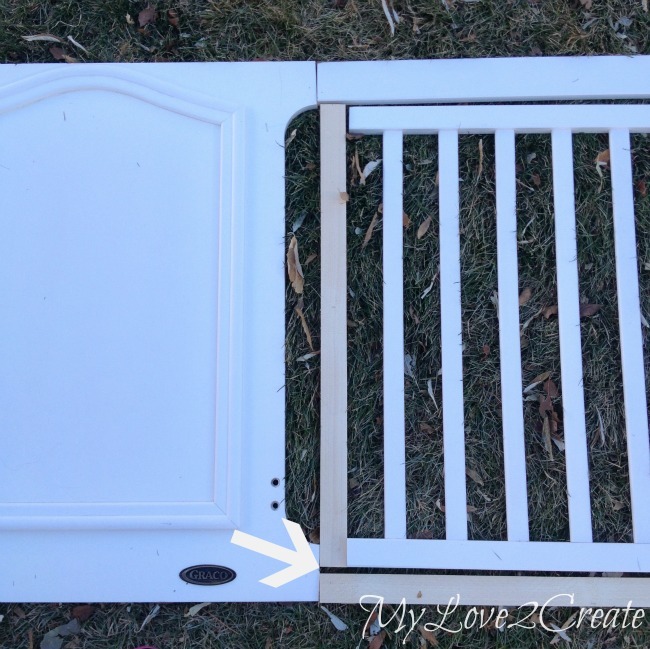 These photos show how we open and close the crate, I got the latch at home depot, but the paint stick idea at the bottom could be repeated at the top to save money! 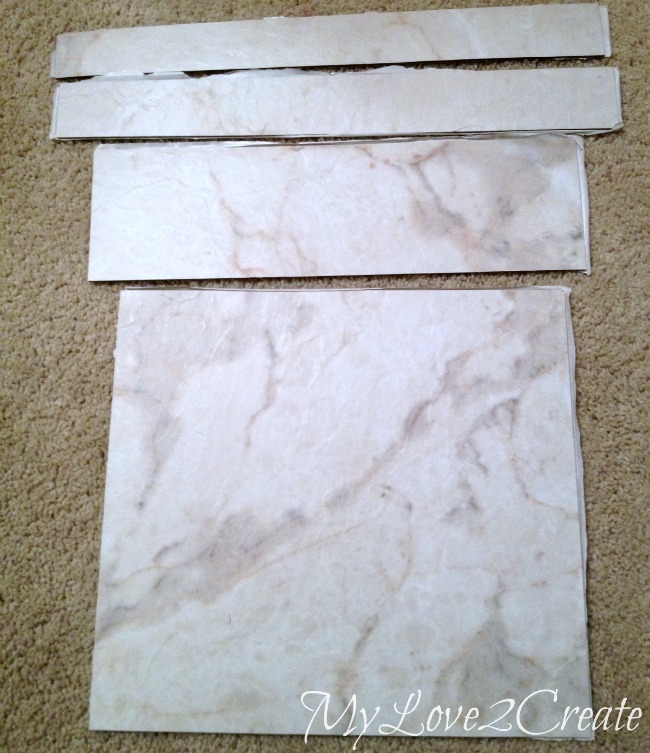 Here is a shot of the marble vinyl floor! It is nice and smooth and I am happy I installed it over the plywood. Sunny really does love her crate! It is perfect for her to sit, stand, and curl up in a ball and sleep! She will be sleeping or resting in her open crate! It is her safe place and she loves it, and I love the way it looks in my room! So much nicer than that old ugly wire crate. That is it! 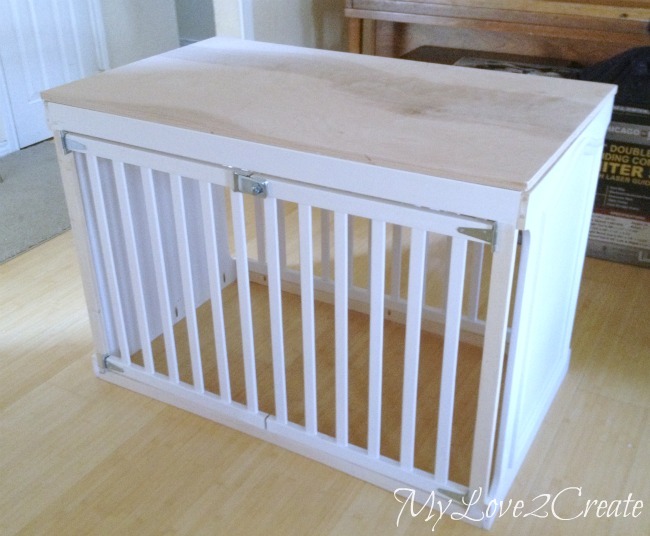 I saved sooo much money repurposing a crib to make this dog crate and I actually like it better than the ones I saw online! Also, incase you were wondering, Sunny is NOT chewer...if you dog is then maybe this is not the best solution for you...just sayin'. Wow you did a wonderful job. I love making something great out of nothing or next to nothing. I made my dog a crate out of Oak that we removed from our house during a remodel. 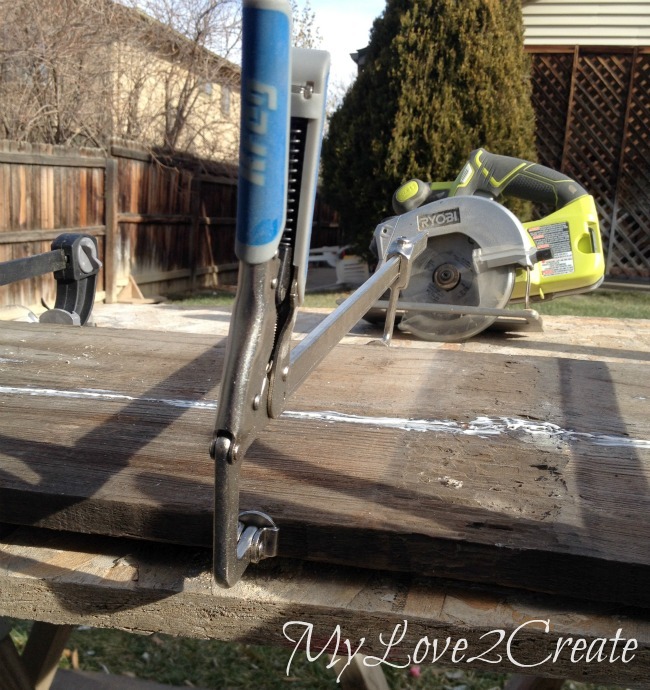 It was the first big project I used the Kregg jig on....love it!! 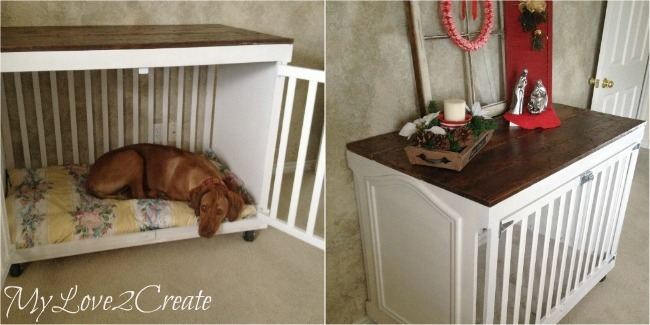 I am going to keep your crib dog crate in mind for the next one I make. My son has a German Sheppard that will be needing a new crate, the metal one is awful. Thanks so much for sharing. This looks so sharp! I'm super impressed! Thanks for linking up to talk of the town! what a great idea! 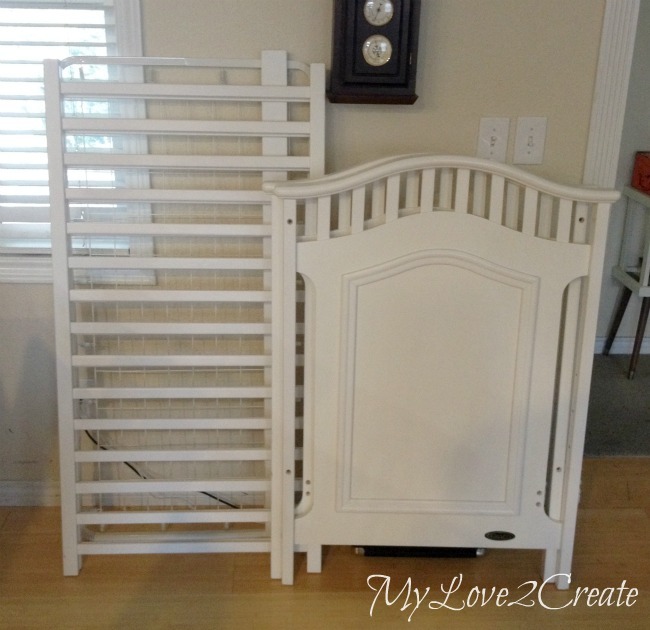 This crib to crate looks awesome and 1 zillion percent better than the metal ones they have in the stores. Thanks for the tute! Visiting from the link party... 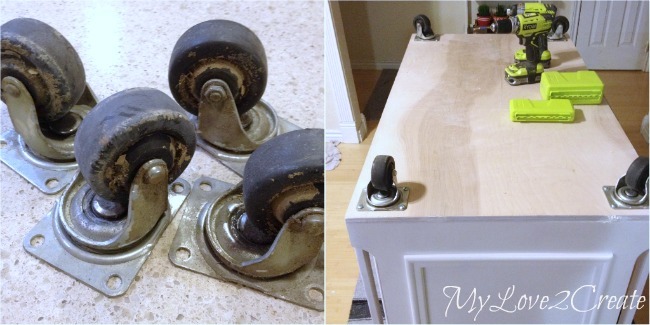 This is such an awesome upcycle! Big wire crates really are so ugly (we have a boxer). 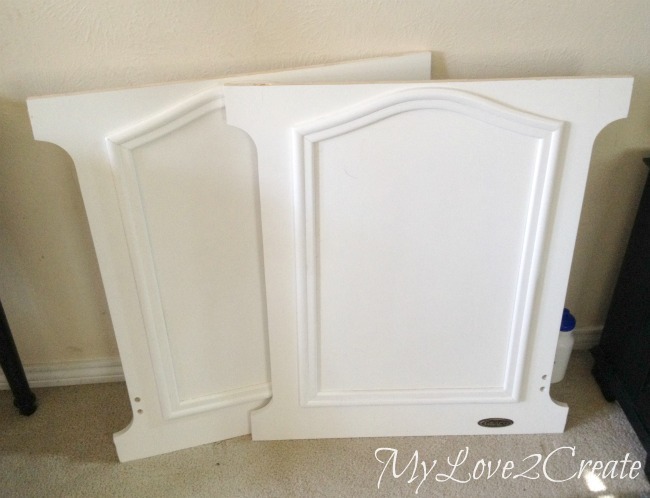 I would love to feature this on my 2nd blog DIY Furniture Makeovers (http://diyfurnituremakeovers.com) if that's alright with you! (One before and one after photo, short description, and a link back) Let me know- thank you! 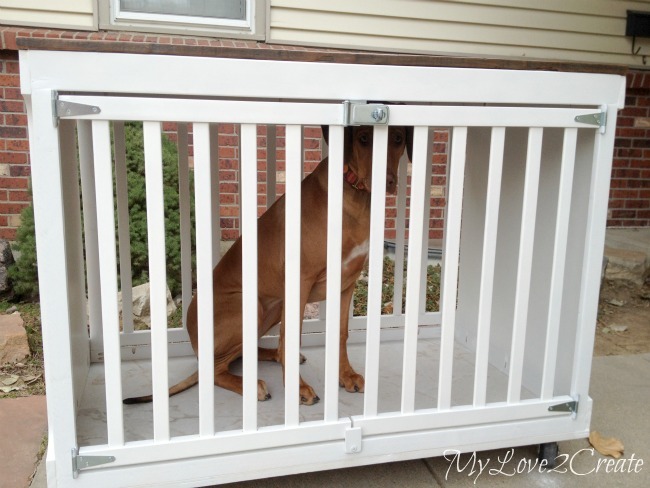 I love this idea for big dogs! What a great idea. We don't have a dog buy have lots of friends and relatives that do - I will definitely share this with them. How creative! Sunny's a lucky dog. The new crate/crib is so cute and useful. Great job. I saw your link at Becca's DIY Vintage Chic party. Such a great repurposed idea--sharing on Facebook later today! Thanks for linking up to Talk of the Town. What a smart idea! 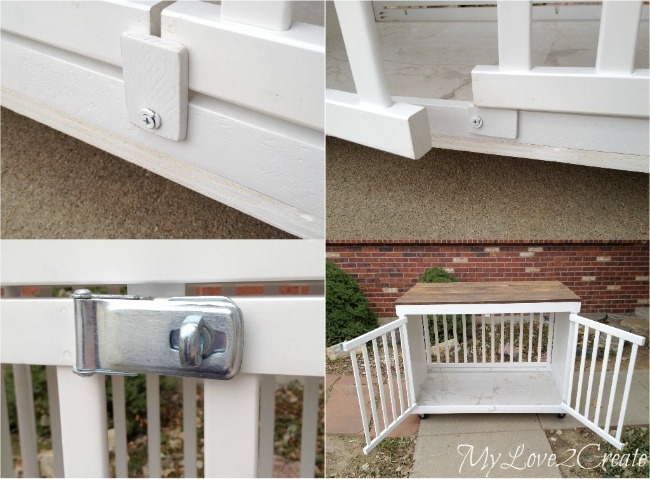 One of the best upcycles I've seen for a crib! 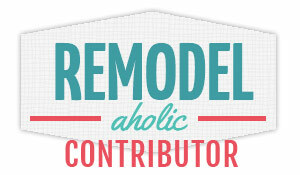 I'm featuring it today on You're Gonna Love It! You did a very impressive job. Love the idea and the wood on top. What a great idea. Our dog loves her crate that sits in a corner of our bedroom. I would love to get rid of it, but it's her happy place. I wouldn't mind the crate if it was cute like this one. 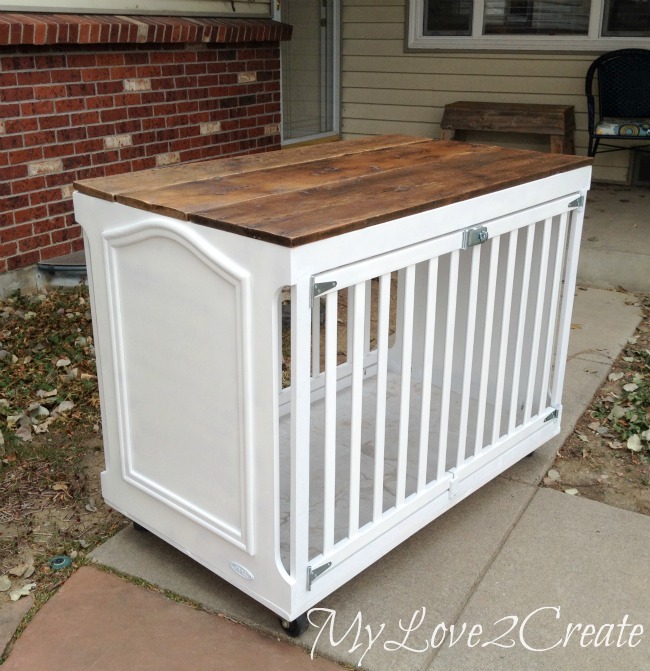 Everyone always wants to hide the dog crate in the laundry room or out of the way, this one could almost go center stage in the living room, lol. Very creative and useful. Pinning and sharing. 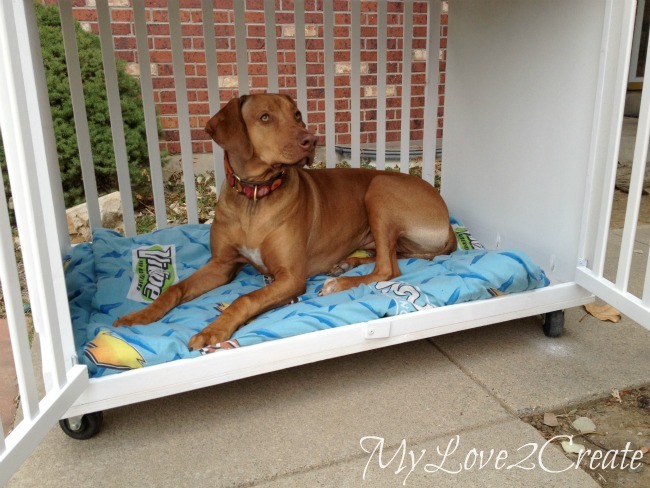 I have a 70 pound Lab Pitt mix and his ugly wire crate is in my sunroom - UGH ugly - I am creative and good doing stuff but I think this one is over my skill set. Wish you could come help me! I really need this. Hi! This is amazing!! Just wondering, do you think it could be done without the fancy tools? I really want to give this a go for my puppy Wentworth as he's quickly outgrowing his hideous wire crate, but he's not yet trustworthy enough to have free range of my bedroom when I'm sleeping! I'm glad I found your blog by 'accident'. Love it! It's my Lotte's first birthday today, she is a boxer, similar in size as you're Sunny. And then I came across this beautiful dog crate. Lotte wants (and deserves) one too. Spend 4 months ago a lot of money on a larger size folding crate with about the same size as your crib-crate. 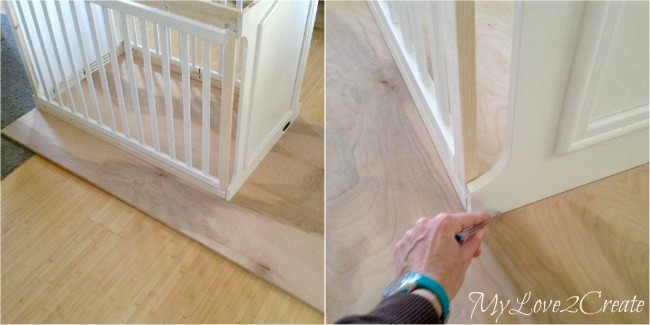 I'll be searching for a crib too, and when eventually finished, I'll send you the outcome!